Visitor Pattern allows adding new methods to existing hierarchies without modifying the structure. One can dynamically add new behavior to the class. Decorator Pattern is another pattern in this family. Our example deals with a student enrolling to a painting course. There are number of courses available, like Pastel Course, Oil painting course and water color course. Enrollment Manager enrolls a student to a painting course. There are now few rules which governs the limit and cost of the course. If it is pastel course, for the first 10 students, there is a discount. In case of watercolor course, student is allowed to bring their own material. In which case, there will be a cost reduction of 200. In all other courses, management will supply the material. Management has observed that they can afford more people in pastel courses as the space requirement is not so much. Here is the code for OilCourse. Note other courses will be in similar lines so I am not pasting the code here. CourseCostAduster is the class which adjusts the cost per course based on the various rules. LimitAdjuster adjusts the upper cap of the class. LimitValidator validates whether the limit is violated. EnrolmentManager does the job enrolling a student. It adjusts the cost and adjusts the upper limit if needed. The main problem with the above design is we have rules which keeps coming and for every rule we need to do the type check on course to do the course specific logic. There is a dispatching involved which we are managing ourselves and not using the power of polymorphic. We will now use Visitor pattern to dynamically dispatch the logic to the right rule validating classes. Each rule will now implement the above visitor interface. With this change we now have all rules in proper methods. In a way, we are partially successful in dissolving the ‘if instanceof PastelCourse’ and else dispatching pattern. Now our next task is to apply the rule to the course. We will now introduce a new method to Course interface to accept the rule. 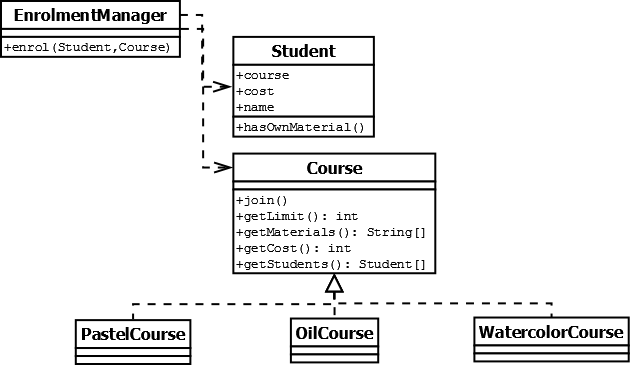 The method accept(visitor) will simply pass itself to the visitor object. Due to polymorphism, the control will automatically get dispatched to the right visitor class. The visit method as you know is overloaded and there are multiple versions available in Course interface. Again due to polymorphism, the control will get dispatched to the right visit method. Thus in visitor pattern, there is dual dispatch, first the visitor and then the visited.